The internet can be a scary place, especially when viruses and malware get involved. The FixMeStick can help fend off attacks against your PC. 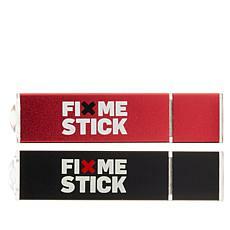 Practical and cost-effective, the FixMeStick offers lifetime virus removal to give you peace of mind. The FixMeStick runs on its own Linux operating system and gets to work prior to Windows startup, which enables it to ""hide"" from viruses and malware that are activated when your computer is running. This allows the FixMeStick to catch those infections that your anti-virus software might miss after the system has already booted. The FixMeStick fits right in the palm of your hand and plugs into any USB slot, with no software installation or passwords needed, and it won't slow down your computer. The external device is almost hands-free. Upon plugging in the FixMeStick, it will search for an internet connection, download the latest anti-virus and malware signature updates, and get to work scanning your computer. Once the scan is complete, the FixMeStick will disinfect your PC, eliminating traces of malware from the registry and the file system, or quarantining problematic files until a solution can be found. The FixMeStick comes in several attractive colors and can provide virus protection for three to six computers, depending on the version purchased.